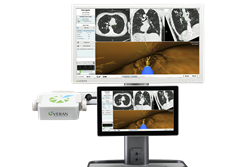 Veran Medical continues its mission to stage shift cancer with the launch of new SPiN Perc™ Localization Needles and software designed to locate and guide precise resection of small suspicious nodules likely to be early stage lung cancer. The SPiN Perc™ Localization Needles will be available in 1cm and 2cm dye marking zone lengths to precisely localize small, deep nodules (not visible or palpable) - in the OR immediately prior to surgical resection. Lung Cancer remains the number one cancer killer worldwide. 94 million current or former smokers remain at elevated risk in the U.S. alone. More than 8 million people in the U.S. currently meet the criteria for lung cancer screening. When suspicious lesions are discovered, patients need answers. But mounting clinical data suggests that a large percentage of the hundreds of thousands of bronchoscopies performed every year on suspected lung cancer patients are non-diagnostic—delaying potential lifesaving therapy. Veran is a privately held medical device company headquartered in St. Louis, MO. The company’s main focus is assisting physicians in the early diagnosis and treatment of lung cancer. In the United States, lung cancer kills more people each year than breast, prostate, pancreatic and colon cancers combined.